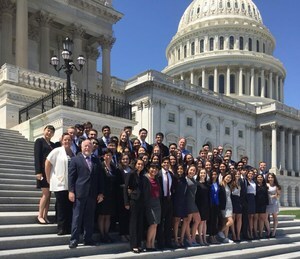 Congratulations to our Amador Valley and Foothill High School competitive civics teams on a historic year at the National We the People Finals! 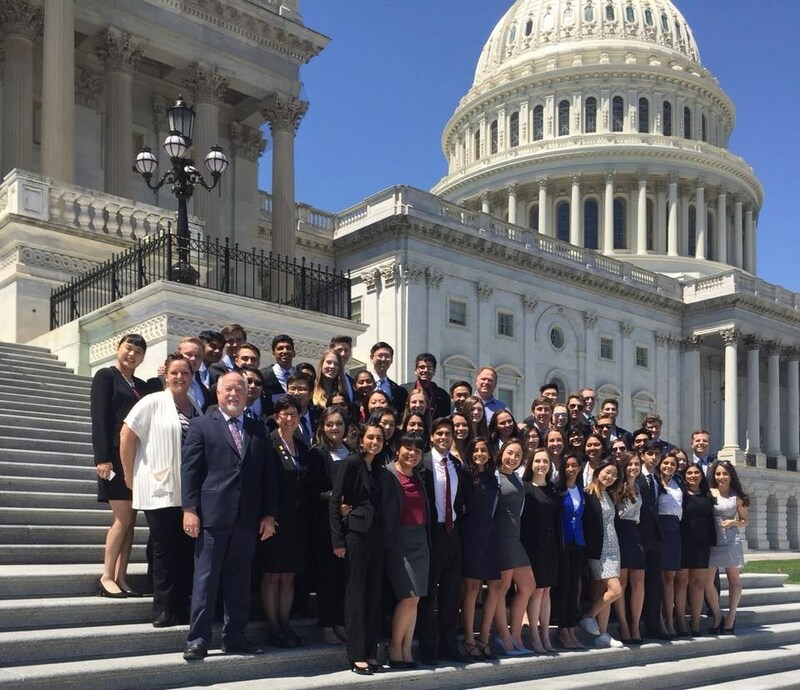 Congratulations to our Amador Valley and Foothill High School competitive civics team who finished among the top four teams in the National ‘We the People’ competition held in Washington D.C. on April 27-May 1, 2018! Amador Valley placed 4th and Foothill came in 2nd place as the national runner up out of 52 teams and over 1,100 high school students from across the United States. Pleasanton was the only school district to have two teams place in the top five. We the People is a national educational program which promotes civic competence and responsibility. Students demonstrate their understanding of government and the Constitution by participating in congressional hearings. In a historic year, both Amador Valley and Foothill teams from Pleasanton advanced to Nationals after Amador placed first and Foothill second, with a difference of just four points, during the California We the People Competition held in February 2018. The Amador and Foothill teams’ historic finish was a culmination of thousands of hours of preparation by the students, teacher coaches (Foothill led by Jeremy Detamore and Amador led by Stacey Sklar), as well as parent and competitive civics alumni. Foothill has excelled in recent years, advancing to Nationals for the first time in the 2015-2016 school year. “It is a true honor to have worked with this remarkable group of students. While I am overjoyed about our success, I’m sad that it means that our time working together is coming to an end,” said Foothill competitive civics coach Jeremy Detamore. Amador has advanced to Nationals 16 times, and finished among the top 10 teams 13 times. In 1995, Amador was the National Champions. The Pleasanton Unified School District congratulates all of our We the People student competitors. Foothill High School’s competitive civics team includes: Max Moeller, Charlie Das, Jessica Maloney, Malini Manimaran, Julia Tolari, Nathan Daniel, William Rose, Yuna Jeong, Omar Qureshi, Arman Abrishamchian, Rithu Gurazada, Sanjana Singh, Eleanor Savas, Deema Afana, Emily McElroy, Lauren Dennen, Nina Paranjpe, Ashley Johnson, Avni Patel, Maggie Wade, Anirudh Rengarajan, Will Carlson, Leland Zhang, Rachel Sanchez, Jared Tay, Lili Cook, Mariah Nibert, and Cassidy Syao. Amador Valley High School’s competitive civics team includes: Varun Iyer, Carter Person, Nithya Swaminathan, Jonathan Yang, Andreas Maass, Kevin Zhu, Tania Gupta, Cathrine Lilja, Elise Allari, David Crofton, Mayank Sharma, Surya Venugopal, Kyle McGarrity, Amber Xie, Sachi Kheny, Justin Zhao, Tiffany Jing, Eknoor Kaur, Dorsa Sahafzadeh, Ziaan Rajabali, Calla Li, and Mariana Zuniga.